Viscount Say & Seale. 1. Hodie 2a vice lecta est Billa, intituled, "An Act for vesting a Messuage and Lands, in Stevenage, in the County of Hertford (the Estate of Richard Nodes), in Trustees, to be sold, for making a Provision for his Wife and Children, equal to the Provision secured to them out of the said Estate." Viscount Longueville. Epus. Duresme, & Crew. Their Lordships, or any Five of them; to meet on Friday the Sixth Day of June next, at Ten of the Clock in the Forenoon, in the Prince's Lodgings near the House of Peers; and to adjourn as they please. The Lord Jeffreys reported from the Lords Committees, the Bill, intituled, "An Act for Sale of the Estate of William Davison Esquire, deceased, for Payment of Debts, and raising his Childrens Portions charged thereupon," as fit to pass, without any Amendment. Hodie 3a vice lecta est Billa, intituled, "An Act for Sale of the Estate of William Davison Esquire, deceased, for Payment of Debts, and raising his Childrens Portions charged thereupon." ORDERED, That the Commons have Notice, that the Lords have agreed to the said Bill, without any Amendment. 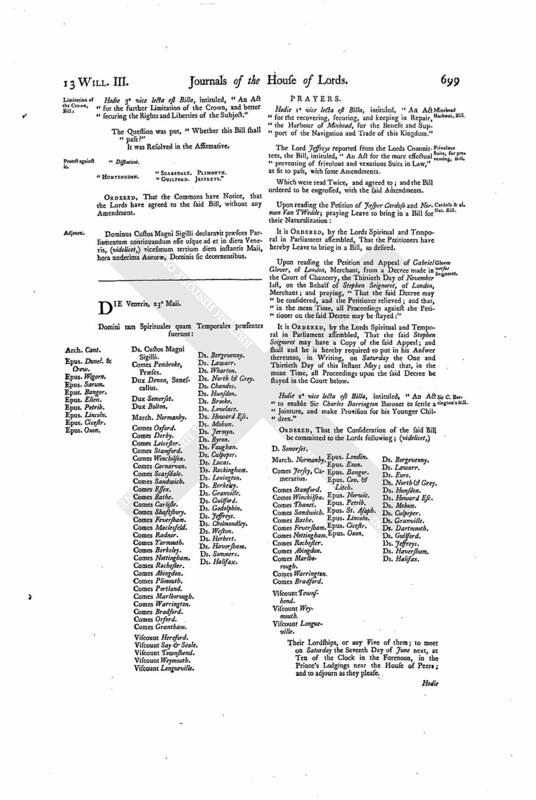 Who brought up a Bill, intituled, "An Act to enable Sir Charles Barrington Baronet to settle a Jointure, and make Provision for his Younger Children;" to which they desire the Concurrence of this House. 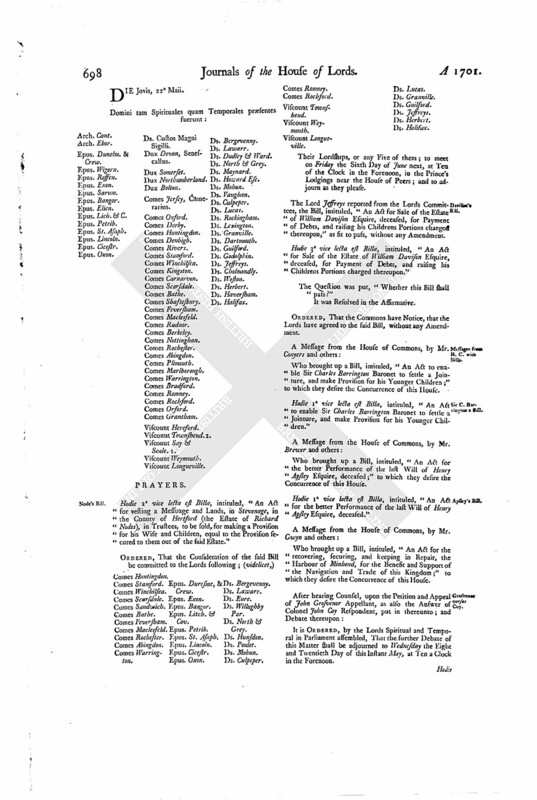 Hodie 1a vice lecta est Billa, intituled, "An Act to enable Sir Charles Barrington Baronet to settle a Jointure, and make Provision for his Younger Children." Who brought up a Bill, intituled, "An Act for the better Performance of the last Will of Henry Apsley Esquire, deceased;" to which they desire the Concurrence of this House. Hodie 1a vice lecta est Billa, intituled, "An Act for the better Performance of the last Will of Henry Apsley Esquire, deceased." Who brought up a Bill, intituled, "An Act for the recovering, securing, and keeping in Repair, the Harbour of Minhead, for the Benefit and Support of the Navigation and Trade of this Kingdom;" to which they desire the Concurrence of this House. It is ORDERED, by the Lords Spiritual and Temporal in Parliament assembled, That the further Debate of this Matter shall be adjourned to Wednesday the Eight and Twentieth Day of this Instant May, at Ten a Clock in the Forenoon. Hodie 3a vice lecta est Billa, intituled, "An Act for the further Limitation of the Crown, and better securing the Rights and Liberties of the Subject." Dominus Custos Magni Sigilli declaravit præsens Parliamentum continuandum esse usque ad et in diem Veneris, (videlicet,) vicesimum tertium diem instantis Maii, hora undecima Auroræ, Dominis sic decernentibus.